The previous post in this series covered the initial go/no-go decisions: are you required to build a job aid? Does a need for rate or speed make a job aid impractical? What that means is: use what you know about the task to help determine whether building a job aid makes sense. You can go about this in many ways, but the following questions quickly cover a lot of the territory. How often does someone perform the task? “Often” is a relative term–in fact, most of the questions in Ask the Task are relative. That doesn’t mean they’re not pertinent. Asking “how frequent is frequent?” turns your attention to the context of the task and the people who typically carry it out. Frequency isn’t the same thing as regularity. Some tasks are frequent and predictable, like a weekly status update. Some are more random, like handling a payment by money order. And some are much more rare, like a bank teller in Vermont handling a money transfer from Indonesia. Whether you end up building a job aid, designing training, or just tossing people into the deep end of the performance pool, you need some idea of how frequent “frequent” is, and where the specific task might fall along a job-relevant frequency scale. Think about what frequency might tell you about whether to build a job aid. Yes, now. I’ll tell you more at the end of the post, but we both know you ought to do some thinking on your own, even if we both suspect few other people will actually do that thinking while they read this. How many steps does the task have? It’s true, some tasks don’t really seem to have steps. Or they have very few: look up the arguments for the HTML <br> tag. And some tasks have so many that it might make sense to break them up into logical subgroups: setting up the thermoformer. Testing the thermoformer. Troubleshooting problems after the test. Think of “step” as the lowest level of activity that produces a result that makes sense to the performer on the job. If I’m familiar with creating websites, then “create a new domain and assign it to a new folder in the \public_html directory” might be two steps (or maybe even one). If I’m not familiar with creating websites, I’m going to need a lot more steps. That makes sense, because a job aid is meant to guide a particular group of performers, and the presumption is that they share some background. If you have widely differing backgrounds, you might end up with two versions of a job aid–see the Famous 5-Minute Install for WordPress and the more detailed instructions. Essentially, that’s two job aids: one for newcomers (typically with more support) and one for more experienced people. As with frequency, you need to think about how many steps the task involves, and whether you think of those as relative few steps, or relatively many. How difficult are the steps? You can probably imagine tasks that have a lot of steps but not much complexity. For someone who’s used to writing and who has solid, basic word processing skills, writing a 25-page report has plenty of steps, but few of them are difficult (other than getting reviewers to finish their work on time). In the same way, a task can have relatively few steps, but many of them can be quite difficult. 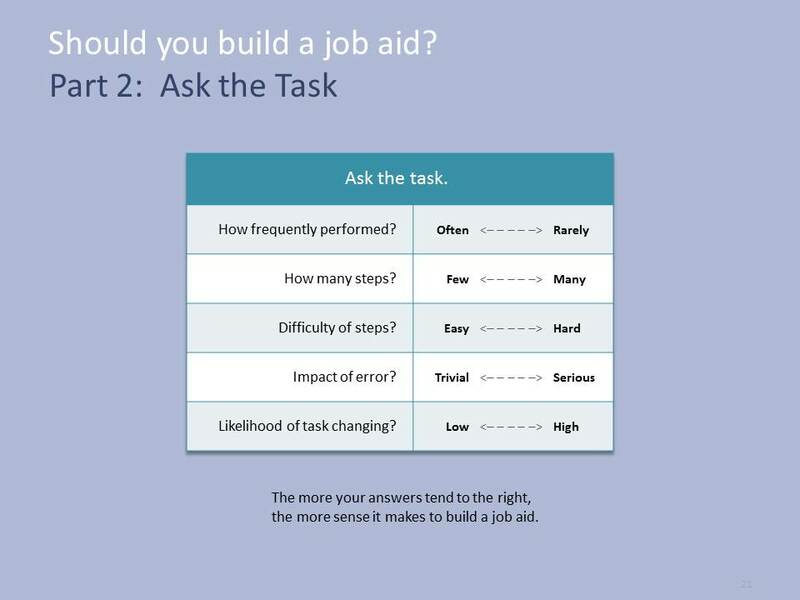 That’s the reason for two step-related considerations when you Ask the Task whether a job aid makes sense: how many? How hard? What happens if they do it wrong? As with the other questions, you need to think about the impart of error in terms of the specific job. And, if you haven’t guessed already, about the relationship between that impact and the value of building a job aid. Is the task likely to change? We’re not talking about whether the job aid will change, because we still haven’t figured out if we’re going to build one. We’re talking about the task that a job aid might guide. What are the odds the task will change? “Change” here could include new steps, new standards, new equipment, a new product, and so on. Ask the task, and the job aid comes out? Right! The more your answers tend to the right, the stronger the case for a job aid. The less frequently someone performs a task, the likelier it is that he’ll forget how to do it. If you’re an independent insurance agent whose practice mostly involves homeowner’s and driver’s insurance, and you write maybe six flood insurance policies a year, odds are that’s not a task you can perform without support. Job aids don’t forget. The more steps involved in the task, the more challenging it will be for someone to retain all those steps correctly in memory and apply them at the right time. Job aids: good at retention. The more difficult the steps are, the harder the performer will find it to complete each step appropriately. A job aid can remind the performer of criteria and considerations, and even present examples. The higher the impact of error, the more important it is for the performer to do the task correctly. You certainly can train people to respond in such circumstances (air traffic control, emergency medical response, power-line maintenance) , but often that’s when the performance situation or the time requirement presses for such learning. Otherwise, a well-designed job aid is a good way to help the performer avoid high-cost error. The more changeable the task, the less sense it makes to train to memory. Mostly that’s because when the change occurs, you’ll have to redo or otherwise work at altering how people perform. If instead you support the likely-to-change task with job aids, you’re avoiding the additional cost of full training, and you mainly need to replace the outdated job aid with the new one. Love this. It looks familiar :) The only thing I’d add here is that these factors are just guidelines and I would really consider a job aid even if the factors fell to the left. For example, in the case of frequency, you might still want to consider producing a task guide or tutorial for some tasks even if the tasks are performed frequently. The hardest part of a new task is often unfamiliarity. Even if a job aid or task guide is only used once, it can often be far better than no guide at all. Job aids / tutorials can form dynamite scaffolds for new tasks. Steve, a great deal of what I know about job aids, I learned from Joe Harless and his Job Aids Work Shop, and from my experience training instructional designers, documentation specialists, and others to build their own. I don’t have much disagreement with your suggestion. Each question in the list is a relative one (how serious is a serious impact? ), and the overall goal is to produce results. So few job aids get developed, in my experience, that the to-the-right simplification might encourage someone to create one where he wouldn’t otherwise. Your new-task example also illustrates how job aids are sometimes used as training wheels, something I mentioned some time back (and I may revisit that topic). In that light they’re a short-term support. The organization or work group might need some way to confirm that the newcomer can perform successfully without the job aid; that could include making sure he’s able to recognize successful completion when he achieves it. I also see that very few Job Aids get developed (yes, even in and would like to see the job aid as a default first step when skills & knowledge are indicated as the gap. Heck, if nothing else, a job aid can make a really nice prototype solution. If it works, great. If it falls short, you have indications on which to base the next layer of solution prototype. I first met Joe Harless at an NSPI (pre-ISPI) conference around 1978. Took his workshops on job aid design, instructional design, and front-end analysis. If you search the Whiteboard here, you’ll find I’ve mentioned him a time or two. Along with similarly-minded folks like Rummler and Rossett (who as I’m sure you know has also written about job aids).